So I was contacted by a publisher (Butterhorse Publishing) and asked if I'd like to review this new book, so here it goes! 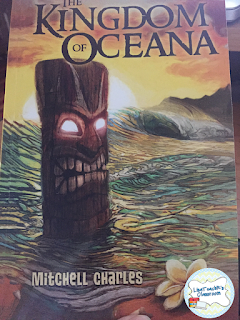 The book is set in ancient Hawaii, long before it was Hawaii and called Oceana. It centers on Prince Ailani and his brother Nahoa. They are on an exploratory trek when the find an old Tiki mask. This mask releases a curse that threatens everything and everyone. It did take me a little while to get into it but once I did, it was thoroughly enjoyable. Lots of action and suspense. I mean, come one, fire walking? Yikes! I liked most of the characters. I thought the mother was a little strange and Prince Nahoa a little flat- sort of one dimensional. I think this will really appeal to my boys in class. There is surfing and danger abounds! The magic and mysticism is wonderful, too. It's obvious that a lot of research went into this book. I don't think It'll work as a read aloud but it'll be a great addition to our class library. Try it for yourself.